Using 12.1.0.2 DB Template for EM 12.1.0.5 - "Hey Alfredo..."
Recently we performed a fresh installation of Oracle Enterprise Manager (EM) 12.1.0.5 using Oracle Database Enterprise Edition 12.1.0.2. as the management repository database. We also installed Oracle Grid Infrastructure 12.1.0.2 so that we could take advantage of ASM for the database datafiles. Oracle provides a great pre-configured database template to help for this particular setup when using EM 12.1.0.5 and DB 12.1.0.2 that can save a little bit of installation time and eliminate having to manually configure various database parameters, tablespaces, etc. The first thing to do is to determine if you fall into the small, medium or large deployment of Enterprise Manager. See the Deployment Size portion of the document to determine which deployment size your environment is best suited for. 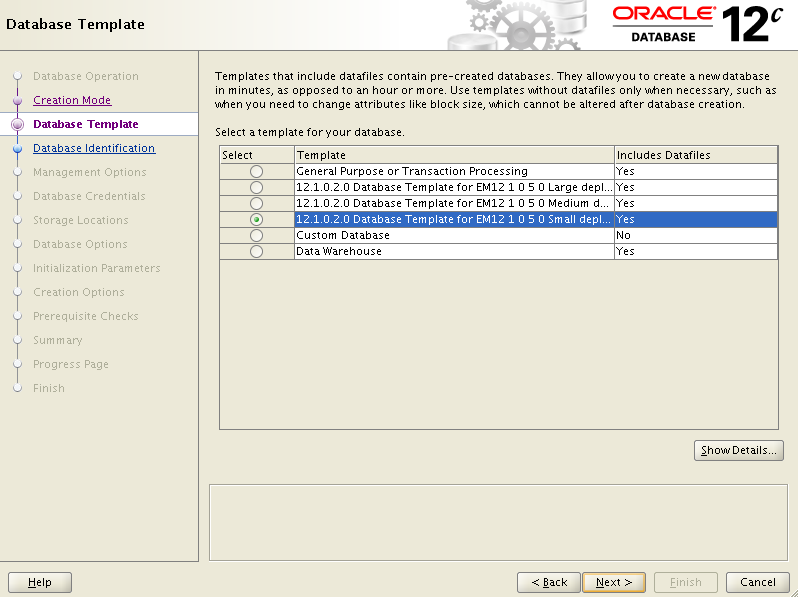 Details about the preconfigured DB template is available right in the EM 12c documentation. Install the Grid Infrastructure home (12.1.0.2) so we can use ASM for our database datafiles. 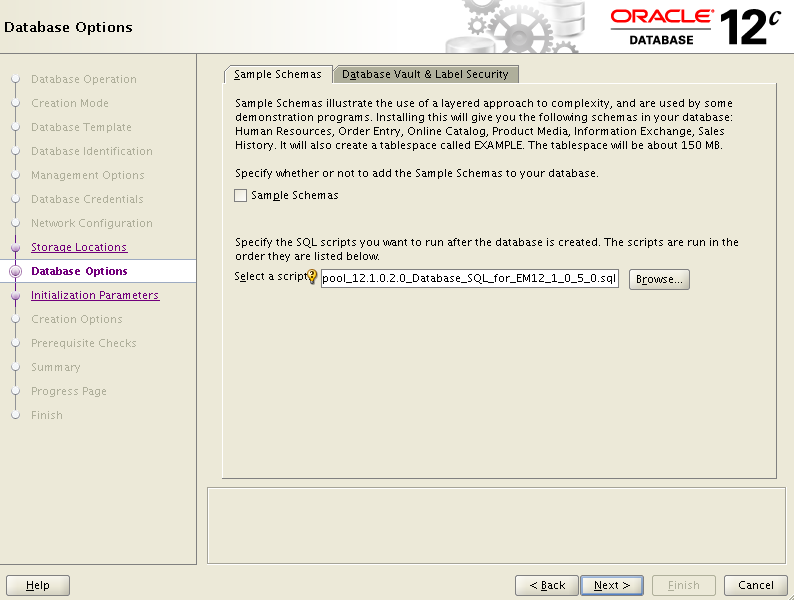 Install the Database home (12.1.0.2). 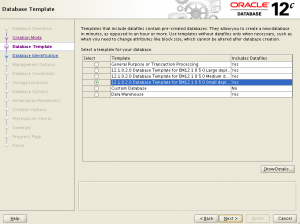 Download the EM template, 12.1.0.2 DB Template for EM 12.1.0.5 on Linux x86-64, from the Oracle Technology Network then start DBCA to configure a new database with it. Once the template is downloaded you’ll want to extract it to $ORACLE_HOME/assistants/dbca/templates so that it appears in the DBCA templates window. Next you’ll want to execute the database configuration assistant (DBCA) and when you get to the database template screen use the EM template (for our example we used the small deployment). Here we can see that the template has set the memory parameters accordingly and the number of connections based on the EM deployment size you chose earlier. Once the database creation is completed we can see that it created the required EM tablespaces for us. All that’s left is to install Enterprise Manager and point to this newly created database. With the EM database template you can see that the configuration of the EM management repository database is made a little easier providing us with the recommended settings based on the deployment size of your EM environment.